Politics are making waves on the App Store yet again. This time the target is CNN’s iOS app. 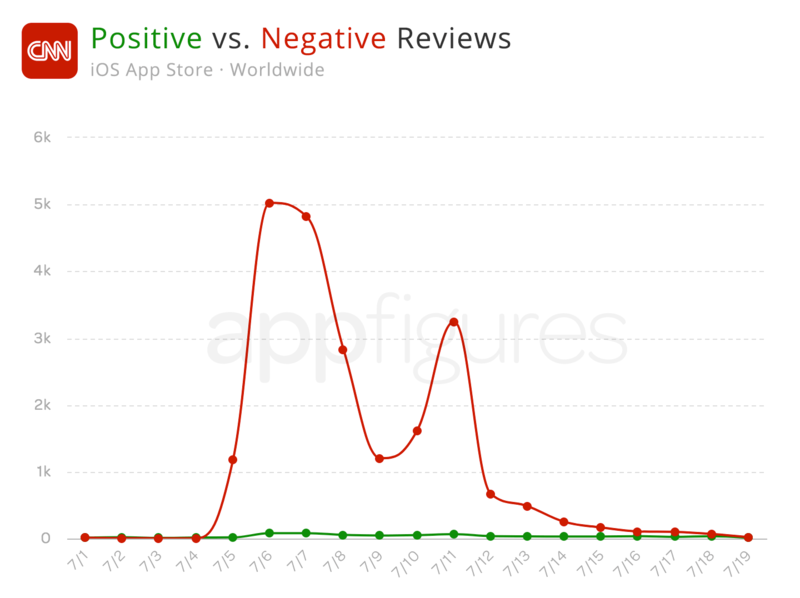 For most of last week, the app has seen an increase of 8,200% in negative reviews. To put this in perspective, before the “attack” the app was getting an average of 35 new reviews every day. During the attack, that number ballooned to as much as 5,000 new reviews in one day — more than 95% of which negative. Most reviews are from the US, with some contribution from Canada and the UK. As you can see in the chart above the attack has mostly subsided, and on the 10th CNN put out an update which reset its low rating. However, as a result, the app’s rank has taken a small hit, dropping the app from its stable 3rd rank in the News category down to 6th in the US. It’s worth noting that during this attack on CNN, Fox News got a small increase in positive reviews. While too small to consider, it did help push Fox up the ranks, where they now sit in CNN’s old chair, 3rd in the News category. We took a closer look at what the reviewers were saying, and the results could have been guessed by anyone who reads the news. “Fake news”, “biased”, and “Trump” top the list. Reviewers were also pretty liberal with their language, sprinkling helpful words such as “garbage”, “propaganda”, “trash”, and “terrible”. It’s hard to tell whether these reviews are the work of some automated bots or a real lynch mob of unhappy users, but one thing’s obvious – this was a focused political attack through the App Store. “but one thing’s obvious – this was a focused political attack through the App Store.” – Or maybe, a lot more people are sick of CNN’s fake news then you have been lead to realize inside of your echo chamber.